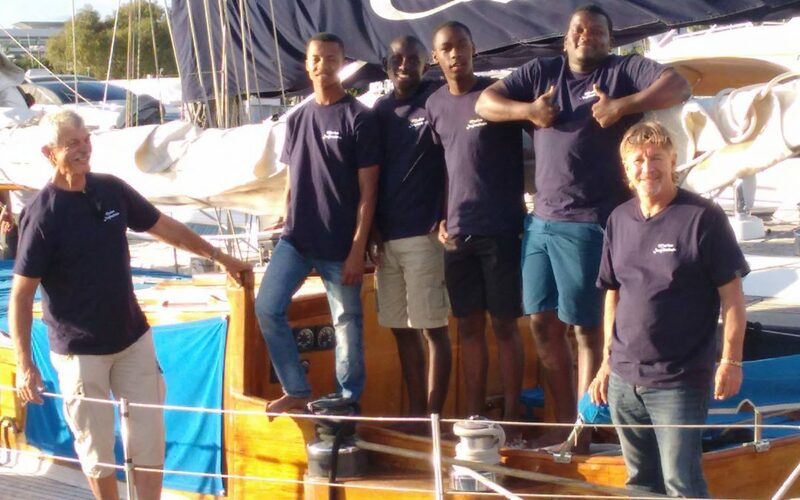 Four South African sailors – two from Lawhill Maritime Centre in Cape Town (Mfundo Joseph and Innocent Jali), and two from the ‘Sail Africa’ programme in Durban (Nhlanhla ‘Lucky’ Phakathi and Menelisi Mkhize) arrived in Mallorca on 1st October to participate in this Marine Inspirations initiative. Whilst living aboard the 1930 classic Schooner ‘Aloha-J of Cariba’, the young men were shown over many yachts and Superyachts of both the sail and motor variety, and visited a number of marine industry support companies and two local shipyards in Palma de Mallorca. On Wednesday, 7th October, the boys sailed the ‘Aloha-J of Cariba’ to Ibiza island, where they explored both the superb sailing conditions around Ibiza and Formentera, and also experienced the local culture and history. This voyage-of-a-lifetime certainly boosted these young South Africans’ super-yacht and maritime career prospects. 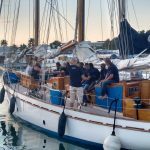 Their visit and 70 nautical-mile voyage to and from Ibiza aboard the 24-metre classic schooner gave them hands-on seamanship and navigation experience for the first time. 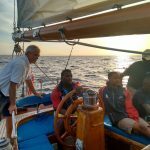 The activities aboard included rope-work, knot-tying, man-overboard drills, helming, navigation, and passage planning. The four sailors, Mfundo Joseph (18) and Xolani ‘Innocent’ Jali (18), both students at Lawhill Maritime Centre in Cape Town, and Nhlanhla ‘Lucky’ Phakathi (21) and Menelisi Mkhize (16), from sailing-organization charity ‘Sail Africa’ in Durban, were the fortunate youngsters selected for this opportunity of a lifetime, which introduces young people to career possibilities in the super-yachting and maritime industry. They were chosen by their teachers based upon the potential and enthusiasm they demonstrated in their maritime-related studies in South Africa. ‘Marine Inspirations’ was founded in 2014 by semi-retired super-yacht captains Phil Wade and Anthony Just, both originally from South Africa, who have had successful careers in the yachting industry and wanted to “give something back”. Phil Wade graduated from Merchant Marine Training Institution ‘General Botha’ at Gordon’s Bay in 1961, and Anthony Just graduated as a naval officer at Gordon’s Bay Naval Officer Training College in 1981 – the same institution, although under different organisation and some 20 years apart. 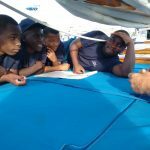 “Phil and I founded ‘Marine Inspirations’ to introduce youngsters from less-advantaged backgrounds to possible careers in the maritime industry. This is the first time traveling on an aircraft for these boys, let alone visiting and sailing aboard super-yachts in the Mediterranean,” ‘Marine Inspirations’ co-founder Anthony Just said. 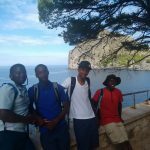 “This is the third group of youngsters for whom we have organized programmes here in the Balearic Islands. We are extremely grateful to Spike Thompson and Amanda Butler at the ‘Ibiza Rendezvous Regatta’ organization for inviting us to participate in their first regatta in Ibiza last year, which gave our first two young participants hands-on experience of racing in a super-yacht event. It was a great experience for the guys last year, and we’re looking forward to taking part in next year’s ‘Ibiza Rendezvous Regatta’ with more visiting student-sailors once again,” he added. A total of 13 young participants have so far benefitted from ‘Marine Inspirations’ initiatives in Europe and the Caribbean since the very first event-initiative of this kind, in October last year. Student Mfundo said: “It’s been great to have this opportunity and the hands-on experience has been really useful. I study at Lawhill Maritime Centre but it’s the first time I’ve been on a sailing boat. The experience will help me to widen my career options. I didn’t know very much about the super-yacht industry before coming on this ‘Marine Inspirations’ programme. All my studies have been focused on a career in commercial shipping and nobody had ever told us about size and extent of the super-yacht industry. I still want to pursue a career as an engineer, but this experience has definitely opened my eyes to other possibilities. 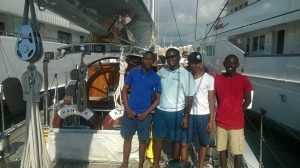 During their stay in the Balearic Islands the four young South African sailors visited a number of marine-related businesses to get an insight into the diverse activities and services that are needed to support the super-yacht industry. They also visited a number of sailing and motor yachts for guided tours aboard. ‘Marine Inspirations’ co-founder, Phil Wade, said: “Our aim is two-fold in that we want to inspire both the young people taking part in our program and also to inspire marine businesses, yacht-owners, captains, and associated individuals to get directly involved by supporting the project and giving opportunities for young people who would not otherwise dream of this option, to potentially pursue careers in the super-yacht industry or other maritime avenues. “Marine-related businesses provide the initiative with goods and services in kind, and also by provide work-experience opportunities and yacht visits for participants. ‘Marine Inspirations’ connects the sponsors directly with the students so that the donor can see exactly where their money is going, in direct-funding for each individual youngster.” Phil said. The Marine Inspirations team were most honoured to be joined for the voyage to Ibiza by the international long-distance swimmer, Anna Wardley. Anna is in the planning and training stages for her forthcoming ‘Balearic Swim Challenge’, during which she will swim – un-assisted – a total of 215 kilometres in three stages: firstly from Menorca Island to Mallorca, then from Mallorca to Ibiza, and then from Ibiza to mainland peninsula-Spain at Denia. Marine Inspirations are proud to be associated with Anna’s formidable task ahead, and are providing whatever logistics and on-water support they can for Anna in her marine-awareness endeavour. Anna joined the team sailing to Ibiza to investigate local waters, sea-currents, and conditions, and the young South African crew were standing by in assistance during her practice swims around the island.